Newt Gingrich has risen from the dead again winning the South Carolina Primary. His resurrection attributed to blasting away at the Republican establishment, élite media and the power of oratory. The debates have been good to Newt, particularly successful is the strategy of attacking debate moderators. Hey, it plays well to the audience in the debate hall. What is good for the ‘Grich’ may not be good for Republicans looking to mount a successful challenge to President Obama. It may also signal something far worse for the Grand Old Party itself. One of the things particularly concerning is the constant references to being a ‘Reagan Republican’. This is followed by an allegiance to a ‘Reagan ideology’. This all sounds great as it as become Republican boilerplate, an accepted way of making your GOP bones. Reagan was not wedded to an ideology, in fact Reagan worked to get consensus as the basis to build on his agenda. The exact opposite of the polarized political environment we currently suffer. President Ronald Reagan served from 1981-1989. What does it say about a political party when a candidate has to reach back 23-years to find and inspirational leader whose legacy has been perverted to make it work? Why the constant need to look back and not forward? Has the party not had a leader worthy of building on in almost the last quarter century? This general trend of dependence on the past is worrisome. I was watching the replay of a C-SPAN panel discussion from the University of Chicago this weekend. Two of the panelist, political strategist Alex Castellanos and New York Times Columnist David Brooks, gave voice to the problem of having a party than seems overly prone to looking backward. The fact is the world has changed. America is more diverse than ever. The power structure and social structure has shifted and will continue to shift. To most of our 25-year-olds Reagan is just a picture on a chart of presidents. It is past time for the Republican Party to get current. The elephant in the room is change. 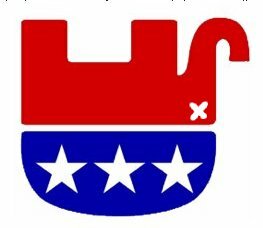 If the GOP is not careful, a lack of change will squish the life out of the party. C-SPAN Video: University of Chicago: Path to the Presidency. Broadcast January 19, 2012. Quotes taken after the 58 minute mark in the video. Posted on January 22, 2012, in Government, Politics and tagged Alex Castellanos, C-Span, David Brooks, Gingrich, GOP, government, new york times columnist, newt gingrich, nytimes, political strategist, politics, president ronald reagan, primary, Reagan, reagan republican, Republican. Bookmark the permalink. Leave a comment.